This is a really interesting find. A walk through a deserted wet market to the third floor unearthed this lot of eating places that was so packed to the brim you just had to see it for yourself. 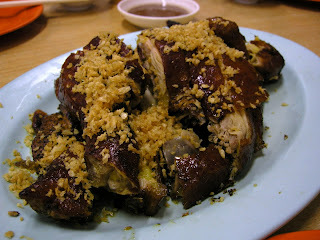 We were recommended to try the roast chicken here, which was tender as can be, covered with a layer of crisp fried garlic. 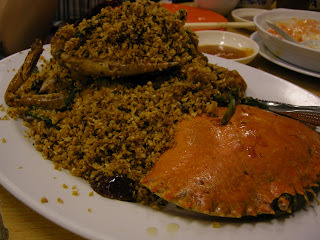 We also had the garlic crab, which was very fragrant. 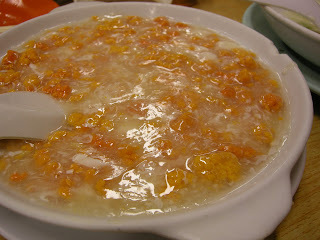 We had the roe cooked with egg which yielded yet another dish. 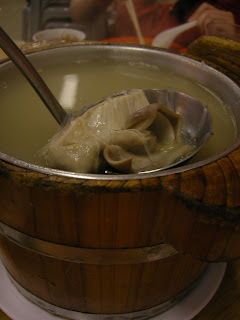 In our greediness, we also ordered the peppery intestine soup which was served in a bucket like dish. In that cool weather, it tasted exqusite. The selection here is just mind boggling.